Tessa Longbons | March 28, 2019. 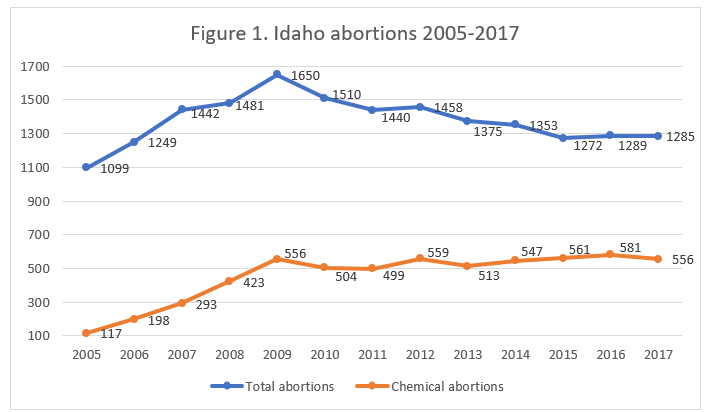 Idaho’s 2017 Induced Abortion report was published by the Idaho Department of Health and Welfare in December 2018. The report shows that there was little change from the number of abortions reported in 2016. *Information on Planned Parenthood’s Idaho market share is not publicly available. Abortion totals declined by less than a third of a percentage point from 2016 to 2017. There were 1,285 abortions reported in Idaho in 2017, compared to 1,289 in 2016 (Fig. 1). Abortions increased by 23 percent from 1994, the earliest year with information available online. In 2017, 556 chemical abortions were reported, dropping four percent from 2016 but increasing by almost 7,500 percent from 2001, the first full year after the U.S. Food and Drug Administration approved the use of Mifeprex as an abortion drug. Chemical abortions made up 43 percent of all reported abortions in 2017. 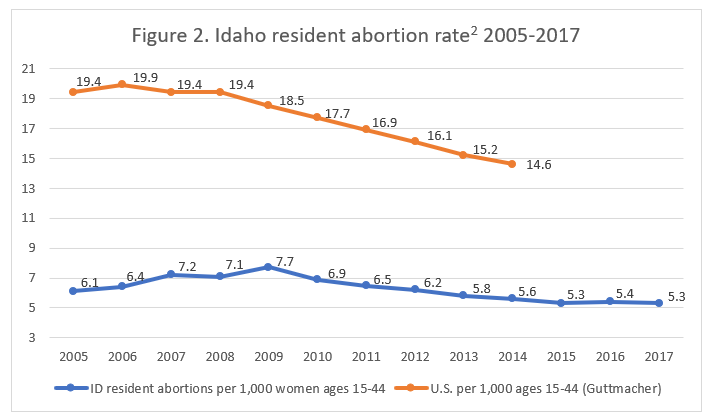 The Idaho resident abortion rate declined from 5.4 abortions per 1,000 resident women of childbearing age in 2016 to 5.3 in 2017 (Fig. 2), one of the lowest rates in the nation. The vast majority of abortions reported in Idaho, 96 percent, were performed on state residents. Four percent were performed on nonresidents or women of unknown residence. Similar to the age distribution in other states, 11 percent of the women were age 19 or younger, 57 percent were in their twenties, 28 percent were in their thirties, and four percent were age 40 or older. More than three-quarters of the abortions reported in Idaho (78 percent) were performed on white women. Two percent were performed on black women, with an additional two percent performed on American Indian women and three percent performed on Asian or Pacific Islander women. Five percent of the reported abortions were on women of a different race and 11 percent on women of unknown races. While the majority of abortions were performed on white women, African American women were disproportionately represented. The Charlotte Lozier Institute estimates that the white abortion rate was 3.2 abortions per 1,000 white resident women in 2017 – less than half the black abortion rate of 7.0. Seventy-one percent of the women getting abortions were unmarried, a lower percentage than in many other states. However, 12 percent did not report their marital status, so the actual number of unmarried women who obtained abortions in 2017 is possibly higher. Eighteen percent of the women were married. Three-quarters reported that this was their first abortion, while 17 percent had had one previous abortion and eight percent had more than one. In comparison, more than half of the women undergoing abortions had already given birth. Twenty-one percent had one prior live birth, and 33 percent had two or more. Sixty-four percent of the abortions were performed at eight weeks of gestation or earlier. Twenty-eight percent occurred between nine and 12 weeks, and seven percent were performed between 13 and 15 weeks of gestation. There were four abortions performed between 16 and 20 weeks and one abortion performed between 21 and 24 weeks. No abortions were reported after 24 weeks of gestation. Educational materials were provided in accordance with Idaho’s informed consent requirements ahead of every abortion except for one. The report states that materials might not be provided in the event of a medical emergency but does not specify whether a medical emergency occurred. Idaho requires parental consent before a girl under the age of 18 gets an abortion; in 2017, 39 minor girls underwent abortions. Thirty-eight girls obtained consent from their parents or guardians, and one was enabled by a court order to provide consent for herself. There were 495 Idaho residents who got abortions in other states. Seventy-six percent, 378 women, traveled to Washington state for their abortions. In total, 1,730 abortions were reported to have been performed on Idaho residents in 2017, 1,235 in-state and 495 out-of-state. Many of the abortions performed on Idaho residents out of state were performed later in pregnancy. Thirty-one abortions were performed between 16 and 20 weeks of gestation, 16 were performed between 21 and 24 weeks, and five were performed at 25 weeks of gestation or later. On July 1, 2018, a new Idaho law went into effect requiring medical practitioners and health care facilities to report complications resulting from abortion. Doctors and facilities who treat patients for complications resulting from abortion must submit a report to the Idaho Bureau of Vital Records within 90 days. Planned Parenthood sued, but a federal district court declined to issue a preliminary injunction blocking the law, allowing it to go into effect pending further litigation. The case has been appealed to the U.S. Court of Appeals for the Ninth Circuit, and litigation proceedings and discovery at the trial court level have been stayed pending the appeals process. In 2017, nine abortions were reported to have resulted in complications.1 There was one instance of hemorrhage, six instances of retained products, and two instances of other complications. Six of the nine complications were caused by chemical abortions. Complication totals will likely be higher in subsequent reports now that the new complication reporting law is in effect. Idaho’s abortion reporting tied for 17th place in CLI’s 2016 study of abortion reporting across the 50 states, New York City, and Washington, D.C. Already, the Gem State has improved its reporting by implementing its new complication reporting law. However, Idaho could also include information on the level of education of women who get abortions and the facilities where abortions take place, data it already collects. Idaho could collect and report information on women’s reasons for choosing abortion and whether any of the babies killed by abortion could have survived outside the womb. According to the Idaho abortion report, the rate is calculated using the following formula: (resident abortions ÷ women ages 15-44) x 1,000.